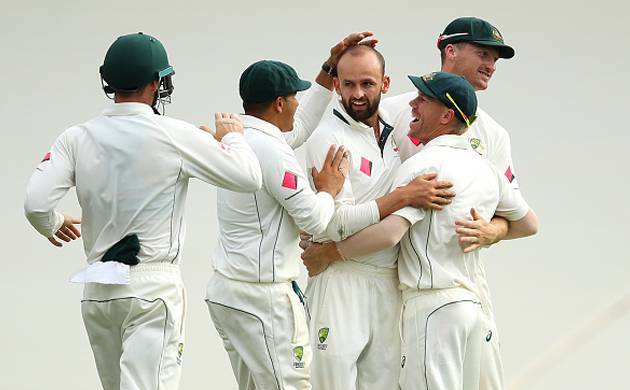 Nathan Lyon wreaked havoc upon Indian batsmen as he took a career-best 8 wickets for 50 runs to help Australia reach a dominant position in the Bengaluru Test. Australian off-spinner Nathan Lyon walked into the record books with career-best figures of 8 for 50 as India scored a meagre 189 runs on the first day of the Bengaluru Test. On another dodgy track, India’s last five wickets fell for only 15 runs in 9.3 overs after they were 174 for five at one stage. A gritty 90 from opener Lokesh Rahul was the lone bright spot in the embarrassing collapse. At stumps, Australia were comfortably placed at 40 for no loss. David Warner and Matt Renshaw were batting on 23 and 15 respectively. Save Rahul, who once again battled a shoulder niggle to display admirable application, none of the Indian top-order batsmen looked like getting a big score. He batted for 205 deliveries hitting nine boundaries with Karun Nair (26) being the only other batsman to cross an individual score of 20. After Steve O’Keefe’s 12-wicket haul in Pune, it was senior-pro Lyon’s turn to torment the Indian batsmen and he recorded the best bowling figures in an innings by an overseas bowler. In the process, he also surpassed Brett Lee to become Australia’s highest wicket-taker against India in Test matches. Virat Kohli won a good toss and predictably elected to bat on a track that not only had turn on offer but also appreciable bounce which made Lyon lethal. Comeback-man Abhinav Mukund (0) played across the line to a Mitchell Starc full toss and was adjudged leg before. However, Rahul and Cheteshwar Pujara (17) negotiated the new ball well adding 61 runs for the second wicket. Rahul also took risks against the Australian pacers, Starc and Hazlewood while earning his first five boundaries in the region between third slip and point. His innings was an example of how to tackle Lyon. There were times he waited for the turn and played late. Just when it looked like India were going into the lunch with only a wicket down, Pujara’s unsure foot movement saw him offer a bat-pad catch off a Lyon delivery to Peter Handscomb at forward short-leg.